Naviguez sur la belle caldera de Santorin (cratère inondé) et visitez les îles de Nea Kameni et de Thirasia lors de cette croisière de 7 heures. Montez à bord d’un bateau touristique au port d’Athinios et admirez les falaises de Santorin et les villes du monde du sucre en conduisant vers Nea Kameni. Profitez de votre temps libre pour vous promener dans son cratère volcanique, vous baigner dans les sources chaudes, puis naviguer vers la paisible Thirasia. Explorez et déjeunez ici à loisir avant de retourner à Santorin. Passez à Oia pour admirer sa célèbre vue imprenable sur le coucher de soleil sur la caldera. Détendez-vous sur le pont en naviguant sur la côte égéenne jusqu'à Nea Kameni, le célèbre volcan de Santorin. Après la prise en charge à votre hôtel de Santorin, rendez-vous au port du côté d’Athinios et montez à bord de votre confortable bateau de tourisme pour votre croisière de 7 heures. Trouvez un endroit sur le pont, installez-vous et profitez de la vue sur les imposantes falaises de Santorin en naviguant sur les eaux de la caldera vers l’île volcanique de Nea Kameni. Ce petit îlot stérile est un parc national et possède un paysage formé de lave et de cendres escarpées avec un cratère volcanique au cœur. Descendez à terre, payez votre entrée au parc et profitez d'environ une heure et demie de temps libre pour explorer le paysage lunaire. Suivez peut-être les sentiers autour du bord du cratère et capturez les vues spectaculaires sur Santorin, avec ses villes blanches chatoyantes accrochées aux falaises. Après avoir exploré, naviguez dans une petite baie côtière alimentée par des sources sous-marines chauffées naturellement. Faites un plongeon dans les eaux chaudes invitantes qui sont censées avoir des avantages thérapeutiques, et frottez peut-être une partie de la boue revitalisante riche en fer sur votre peau. Après une journée de repos, dirigez-vous vers Thirasia, une grande île située au large de la côte nord-ouest de Santorin. Séparée de Santorin par une éruption en 236 av. J.-C., la majeure partie de la petite communauté de l’île vit dans son village principal, au sommet d’une falaise. Allez à terre et profitez de suffisamment de temps libre pour vous promener dans les jolies rues et vous détendre de manière autonome. Si vous êtes affolés, demandez peut-être à votre guide les recommandations de restaurant et déjeunez (à vos frais) dans une taverne ou un café. En fin d’après-midi, retournez au port d’Athinios à Santorin et terminez votre visite par une escale à l’hôtel. 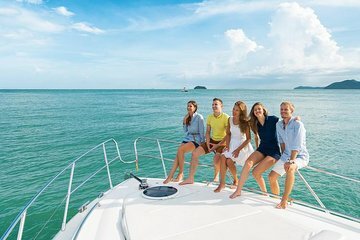 Surclassement de la croisière au coucher du soleil avec Oia: Tirez le meilleur parti de votre croisière en effectuant une mise à niveau pour inclure une visite au village au coucher de soleil d'Oia. Descendez de votre bateau près d'Oia lors de la croisière de retour à Athinios, puis dirigez-vous vers le village d'Oia pour admirer l'un de ses couchers de soleil magnifiques. Dirigez-vous vers les terrasses au bord des falaises et prenez des photos alors que le soleil se couche à l’horizon, projetant la caldera dans une superbe lueur rouge-orange: c’est un spectacle à ne pas manquer! Après le coucher du soleil, votre visite se termine par une dépose à votre hôtel sur l'île. Overall the experience was very disappointed. First stop @ volcano, we have around 1.5 hour, just barely enough for quick hike and come back. The tour guide was never waiting for the majority of the group member to reach the point of a site, before she start to explain the detail of the site. Second stop is swimming near hot spring, but NO LIFE JACKET was provided. Those which can't swim well could only wasting time waiting on the ship. Third stop, is a small fishing island with nothing much to see which were left for 2 hours. Lastly, we had booked the optional Oia sunset tour for additonal 22 Euro. What was included in this optional tour? Walk on your own @ Oia, with only a transport back to Hotel by 7:30pm from Oia. The worse part is, the map given for the bus pick up point is NOT CORRECT, and we had to asked around to go to the correct pick up point. There is similar tour available in viator, with half of the price compare to this tour, that cost use extra 60 Euro. The reason we booked this tour is for the Optional Oia sunset tour, which is nothing beside a transfer back to hotel. I can get my hotel private transport for Eur 25 for 2 pax, instead of Eur 44 for 2 pax to book this tour. I had very pleased experience booking tour via Viator previously, always. But this is the very very bad and disappointed tour provided by Viator, which affect my impression toward viator's tour. This was one of those tours that could have been 10 times better if planned and organized in a more efficient manner - do not fall for the glossy brochures - not worth it! For starters, the tour has more time to kill at the lunch stop at Thirasia 1.5 hours than the actual sights. We only had a short 1 hour stop at the volcanic island of Nea Kameni it takes 25 minutes each way to simply climb to the top. Then for the hot springs, only the people who were willing to swim in the Aegean sea could access them - the rest simply had to sit on shore and see them from a distance. Even the island of Thirasia is a let-down barring the tourist shops and cafes. The highlight of the tour was the boat trip around the caldera of Santorini. Last but not the least - the hotel pick ups and drop offs are poorly organized - especially from the port and there was very little to no communication and we were sitting on the bus for ages waiting to find out what if anything was happening. There are several other wonderful local providers who provide the same experience - in a much better manner for less than the inflated price I paid - please save your money and book something else!! is a beautiful experience but when we get to the hot springs we need to swim!!! and the ship did not give life vest. then people who did not how swim could not enjoy, and it was a bit irresponsible because the sea was deep. Absolutely fabulous. You get everything on this trip - volcanoes, hot springs, a wonderful meal in Thirasia and a HUGE, aromatic climb up the caldera to Oia. Highly recommend this trip. Trip was great overall. Had difficulties locating/gathering info on where the pick-up would be, ride home was a challenge, etc. Had very much help from local hotel owner and tour guides to locate the transportation times and locations. We pieced the trip together and had a splendid time. Just be sure to pin down locations for the pick-up an drop-off locations and times well before the day before the excursion. Have fun! The tour is well organized, a little under pressure of time, but there are many things to do, so you must hurry. The guide was very good and effective. 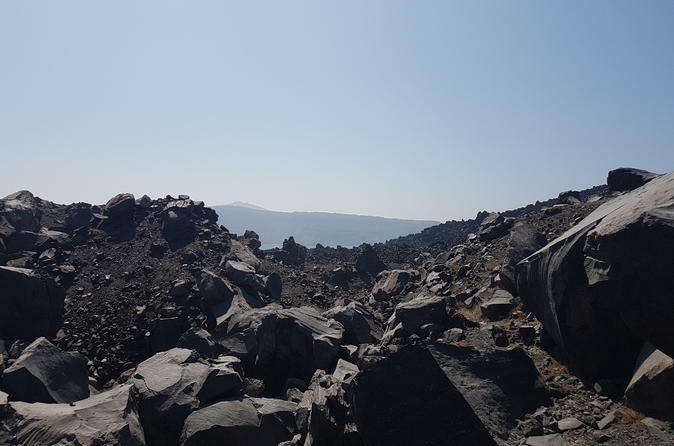 If you make this tour you need a medium phisical condition, because need to climb on the volcano for about half an hour, under the very hot sun. But the views are great. Hot springs are very interesting. You just need to swim a little to reach the springs. There was a bad aspect at the end of the trip. We did not book the sunset in Oia because we lived there. Normally we should been dropped off to the hotel, accordind to the offer. But the people who lived in hotels in Oia were debarked together with those who booked the sunset, so we had to climb more than 200 steps in a hot day, after a tirefull trip. This was not supposed to happen, and for some peaople it might be very difficilt, maybe impossible if they have some health problems. At least inform us before! Otherwise, is an interesting tour! We booked this tour with high hopes, however we were sadly disappointed. Confirmation with the local provider was done easily and without issue confirming our pick up location from our hotel. We were transferred to the port via a hour bus ride with not one word from the driver until we arrived at the port. We were provided with approx 1.25 hour at the volcano, just enough time for a quick hike up to the rim of the crater and back with a brief one minute description from our tour guide. We arrived at the hot springs where the ship stopped approx 5 minute swim away from the springs and we were allowed 30-40 minutes at the spring which was not sufficient time to relax. We were then taken to a small fishing island were we were left for 2 hours ! This was way too much time compared with the other short stops along the way and I feel this tour could be significantly improved by increasing the time at the two volcano stops and decreasing the time at the small island as there was not a lot to do apart from have lunch which did not take this amount of time at all. The most disappointing and upsetting part of this tour was the way it ended. When booking the tour our Viator voucher specifically stated Inclusions: Hotel pick up and drop off. However when the ship arrived at Oia to drop off the sunset tour visitors as our accommodation was near Oia town the 'tour guide'' informed us we would not get a transfer back to our hotel as promised in our voucher. He stated we would need to walk up the 300 steps to the town and then from the town to our accommodation. I attempted to explain to the tour guide we were booked for a return transfer and he abruptly and loudly spoke over me stating its people like you that make me loose my job. and then stated there is no transfer. This was incredibly disappointing and the tour guide made no effort to even look at the voucher or listen to us, we were told to get off the boat and walk or to stay on the boat and pay privately for a taxi from the port further down the island. As the voucher and inclusions for this tour specifically stated hotel pick up and drop off, we did expect this to occur. I do not recommend this tour both due to the poor customer service and the tour guide's abrupt and almost aggressive manner when a issue arose and also due to the lack of transfer back to our hotel resulting a 300 step walk up the side of the cliff to the town. Very disappointing. The trip itself was a breathtaking experience on the Aegean Sea! I particularly like walking up the volcano. The only thing I would suggest is that the transport to and from the ship be presented more clearly. We were led to believe that we would be picked up at the hotel and we were notified the day before that this changed. Also, there was some confusion at the end of the trip as to where to get our bus to return back to the pick-up place. Fortunately we found held on to our invoice, showed it to a bus driver, who then directed us to the correct bus. All in all, it was a great experience! My wife and I booked this excursion as part of our honeymoon and it was a lot more physically demanding than we expected. The hot springs part was first and we were unaware that from where the boat stopped to the hot springs was going to be a solid 4-5 minute swim! The actual hot springs were great, we could feel the water getting warmer and rubbed some of the volcanic soil all over our bodies which made for some great pictures! Swimming back to the boat was the worst because there was one ladder for about forty people so we had to tread water for quite awhile. After the hot springs was the volcano tour. Hiking straight up the volcano in 110-112 degrees after that swim was not ideal. The views from the top are incredible, but it's a tough hike up to the top. We were also glad we didn't book the Oia sunset part. The guests that did had to depart our boat around 4-5pm and either rent a donkey/horse or walk up the 600 stairs to where the town is situated. Not to mention that it was 4 hours or so until sunset. Our guide was great, very informative and spoke eight different languages! It's worth the trip if you can handle it physically!